Trouble holding back all those ponies in your 5.0L Coyote Mustang? 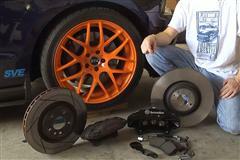 We have brake tech videos to help you control your 2010-2014 Mustang's power. Don't end up in one of the unsafe conditions where your Mustang brake system isn't up to stopping your powerful Coyote Mustang or just worn to the point we can all here you stop that Pony. Replacing your worn factory brake components is easy with the help of LatemodelRestoration.com's large selection of brake parts. Factory brakes not cutting it?? Well check out our tech articles that cover upgrading to more powerful brake kits such as the Ford Racing M-2300-T 13-14 GT500 Brake Kit. 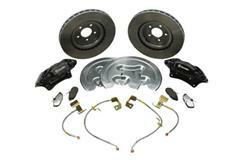 This kit features 15" rotors, six piston Brembo rotors for the front and 13.8" rear rotors. No matter what your brake needs are, we got a solution for you!